"I like to move it move it." Welcome to the board Unbroken1... great setup. after visiting for many time this forum, i have decided to subscribe me and post something. You are one crazy audiophile! Looks like you have enough CPU power for running a mini space program-nice work! What else to do have in that rack with the 1620LE? Also, thanks everyone for posting your little piece of home on this thread. It's been great being in your studios all the way across the country & the world. "We can make a difference if we try"
Thank you very much for the compliment Justin. With the Urei there are 2 25 year old Audio Technology VU meters a DBX 500, DBX 503 and a newer 1986 lol Dbx 3bx Dynamic Range control. Visit DJ Trinity NYC's homepage! I noticed you are using the urei. How many do you have now like 50? Here is a shot of the inside of my bozak. It has 3 phono, true booth output, all outputs have the 30db mod, and aux 1 is half line/half phono. "Music is our spiritual giude through life"
Here's mine, lil late..I will be upgrading with pioneer CDJ 800's on each side of the mixer. I will definately miss the older denon 2600. Last edited by joeydj4u : 12-17-2008 at 03:57 AM. 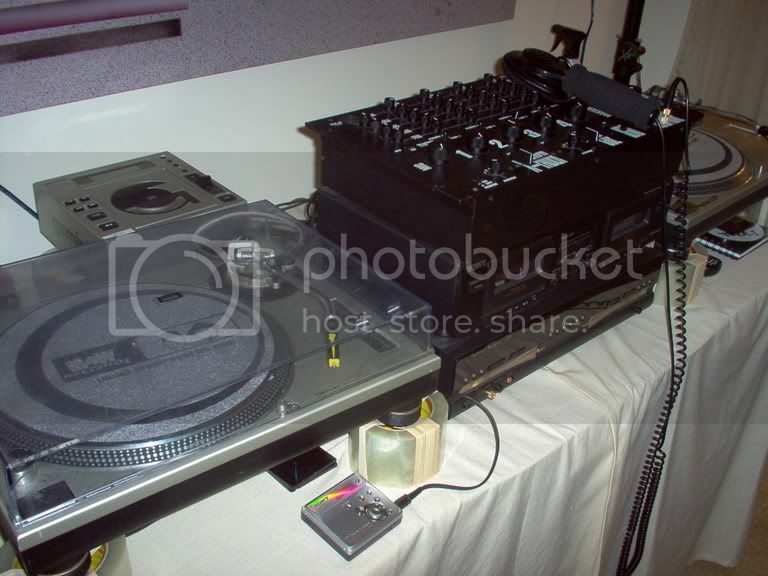 Is that DJ PUNCH'S set up? Ha ha, this is funny I'm actually the one who took that picture. This console belongs to a friend of mine from NJ. At the moment the meters are not hooked up at all. They are not for each turntable. The console has an RLA crossover, so the the meters are meant to monitor the outputs from the crossover. For now my friend doesn't have any subs or tweeter arrays, so the RLA is not in use. I can also tell you that there are two mixers on that console, one Urei and one Bozak. The three turntables are hooked up to the Urei. Three Pioneer CDJ700s are hooked up to the Bozak that in turn is hooked up to the Urei. It sounds a little strange, but I guess my friend wanted to use the warm sound of the Bozak to warm up the sound of his CDs. My GHETTO set up.I made the stick that you see on the NUMARK DM 1920 X KNOB MIXER.My boy is going to build me a console.I hope soon. Finally mounted my 1620LE in my desk.